I’d heard that if you arrive at Auschwitz between 10am – 3pm, you are required to join a group tour of the site lasting about two hours. I’d also heard from people who had done this that you spend the time rushing from place to place without being able to take the time to truly appreciate or realise the true horrors of the concentration camp. As I thought that Auschwitz was somewhere where I would need to spend some time alone to really understand [if that’s even possible], I decided that I’d get there early enough that I would be able to take my time. I can’t say that it was a good day – that would be both inaccurate and disrespectful; there’s nothing remotely enjoyable about going to a place where over one million innocent people were murdered or died from the dreadful conditions there. There’s nothing fun about learning of the misery that people endured here, the torturous existence that the Nazis imposed upon men, women and children in the process of killing them – whether in gas chambers, by firing squad, by hanging, by starvation, as a result of inhumane medical experimentation, or overwork or exhaustion. There’s no denying that any of this happened and yet it still seems unimaginable. I guess it’s easier to treat people far worse than animals when you don’t consider them to be human beings. 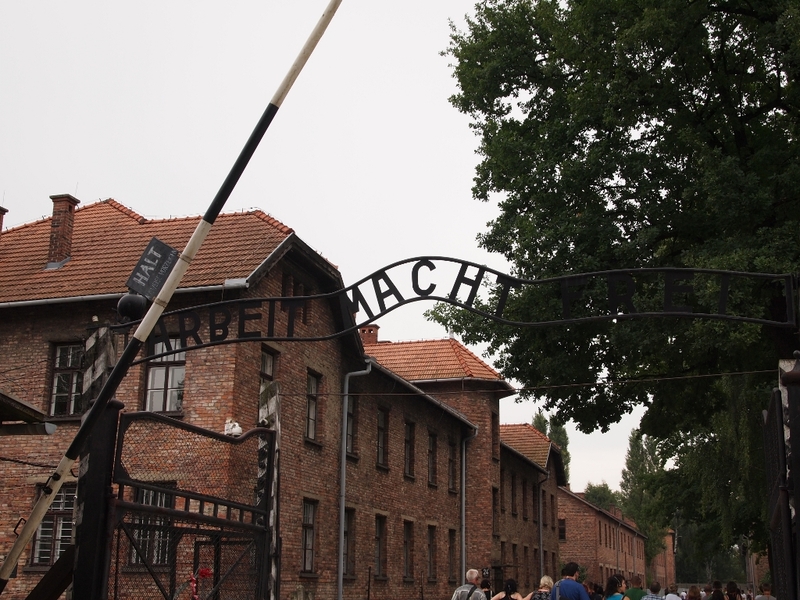 One thing that struck me about Auschwitz was just how innocuous it looked from the outside. Orderly rows of red brick buildings that could have been small apartment blocks, with freshly cut green lawns and a grid of paved roads. It’s very misleading and I imagine it would have looked very different when the concentration camp was active – no grass, dirt and dust and mud roads, barbed wire and everywhere gaunt, haunted people. It’s currently disturbingly peaceful, at least until the tour groups start. Most people understand or are at least aware of the history of the site and behave in a respectful manner – unfortunately this isn’t the case with everyone, and I was horrified to see two girls posing in front of the gas chamber with massive smiles and peace signs. Did they have any idea where they are? I was also disturbed by a couple of guys in their twenties who were climbing up into the bunks for photos. Most buildings in Auschwitz are open for tourists, and have been turned into museums commemorating certain groups or nationalities, or have been maintained as they were during the camp’s activity so that people can get an idea of what it might have been like. The first building I visited turned out to be the one gas chamber still there. I didn’t realise this at first, as I had entered from the wrong side and hadn’t read the sign. I’d wandered through some smaller rooms and into quite a large room, which had an incredibly eerie and cold feel to it, before finding myself in a room which quite clearly functioned as a crematorium – two of the ovens were still in place. It was at that point that I realised that the empty and airtight concrete hall I’d passed through was one of the early gas chambers. It’ a very unnerving feeling, standing in a place where tens of thousands of people were murdered with Zyklon B gas, pellets of which were tipped into the chamber through holes in the roof that were quickly resealed. Reading or learning about it is one thing, but being there is different. For people who like to believe that every life has a purpose, this chamber was the ultimate destroyer of any meaning. All I could think about was the sheer waste of human life, and what might have become of all the men, women and children whose lives were terminated without any flicker of conscience among the killers, had they been left alone to make of their lives what they would; to grow up and grow old, to live and learn. The ovens there were quite small, fitting maybe a couple of people at most, and it must have taken quite a long time to dispose of the bodies. I guess I think that it’s important to remember that the Nazis were pretty generous in sharing the hate when it came to who they thought should be wiped from the face of the earth. There are times that I wish that I wasn’t such an emotional person. Sometimes I wonder whether I simply feel things more than other people, or whether I just struggle to hide how I feel. The one thing that really got to me at Auschwitz was a shoe, one little red shoe. In one of the buildings there are rooms filled with items collected from the people murdered – when they were required to strip before entering the gas chambers and their belongings were taken from them. There is a room full of pots and pans, one of suitcases, another of artificial limbs, one of toothbrushes and shaving paraphernalia, and one full of children’s shoes. That was the worst. The thing about this was that there were tens of thousands of tiny shoes from young children, all in faded browns, blacks and greys. But there was one among them that stood out; it used to be red. It’s faded with time – it’s been sixty-six years since the war ended – but it’s still visibly red. It just made it so much clearer that these were individual people. The numbers and the huge amounts of data and items can be a little overwhelming and when the numbers are so immense it’s easier to become a little dissociated or detached. This little red shoe really brought it back to me and reminded me that every toothbrush, every pair of shoes represents a person. 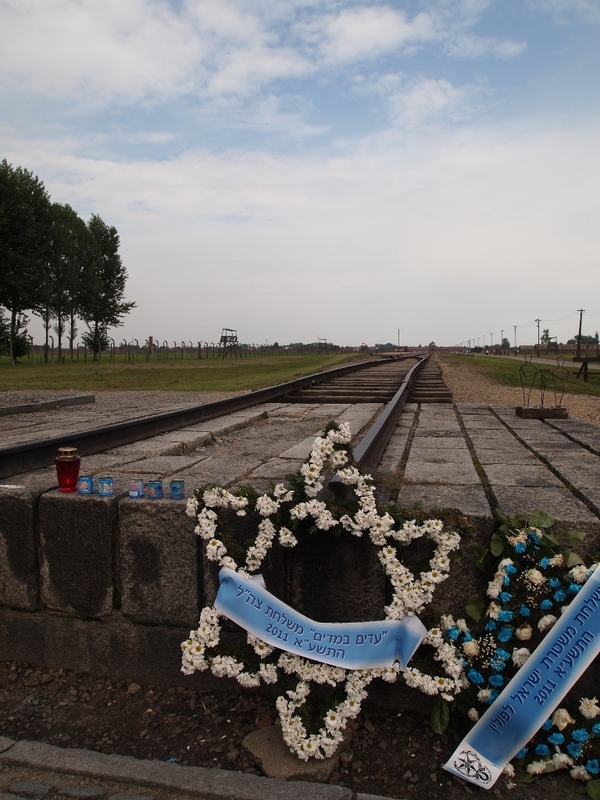 After I’d spent enough time at Auschwitz, I took the bus to Birkenau. 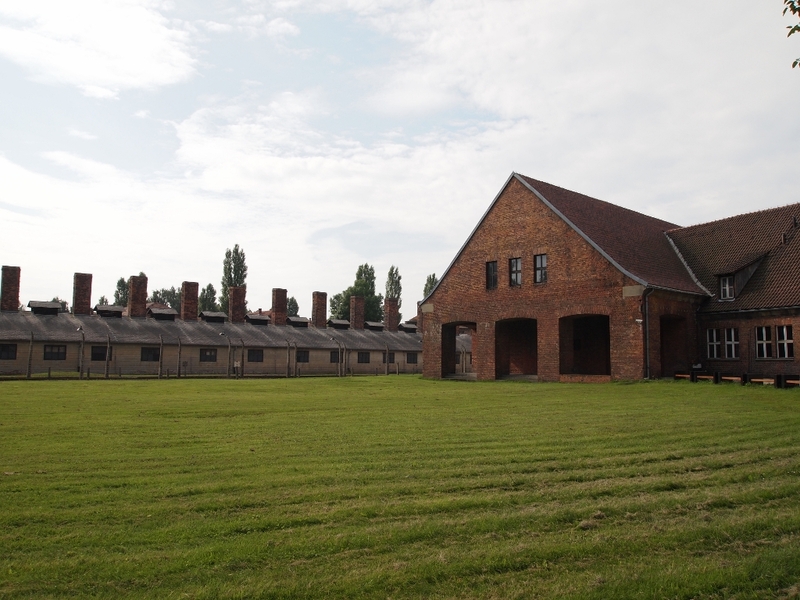 For those who don’t know much about the camps, the majority of people we say were murdered at Auschwitz were actually gassed at Birkenau, or ‘Auschwitz II Birkenau’. 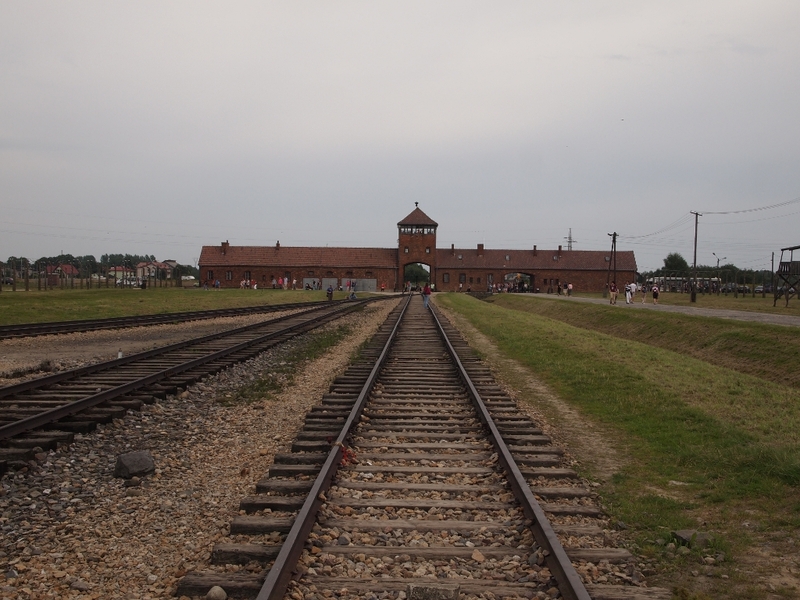 Birkenau is a few kilometres from Auschwitz and it was to here that the trains arrived and selections made, with anyone ‘unsuitable’ for work sent directly to the gas chambers. Birkenau had huge, specially built gas chambers and big crematoriums which were capable of destroying the bodies far more effectively than the smaller ovens at Auschwitz. There’s not much left of Birkenau; a few buildings, the train tracks, memorials where the selections would take place between the entrance gates to the gas chambers on either side. What were the gas chambers and the crematoriums were destroyed by the Nazis prior to the end of the war – they blew them up with dynamite in January 1945 when the Soviets were advancing and the Nazis started the forced death marches from the camps into Germany. The roped off ruins remain, as does a small pond where they used to dump some of the ashes from the ovens. It’s now home to a number of fat brown frogs. 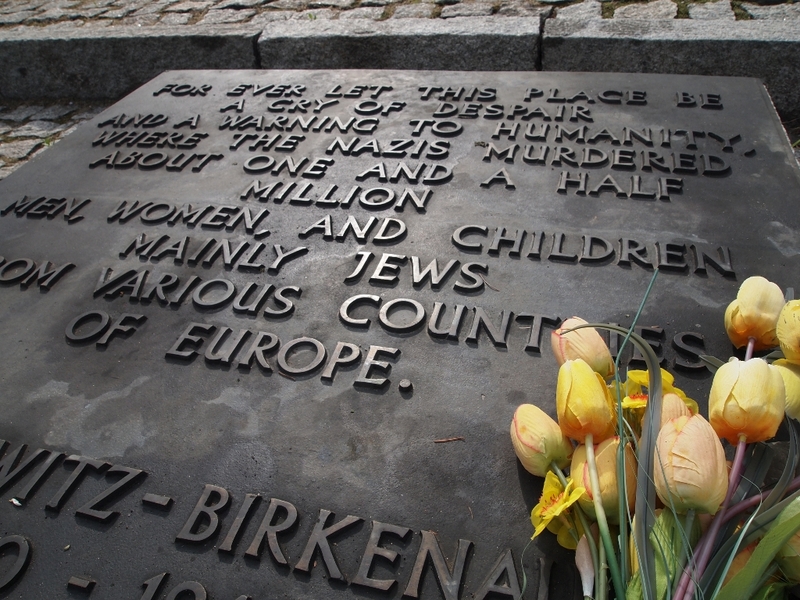 There are memorials at Birkenau translated into many different languages, and many have small piles of stones and some flowers on them in remembrance. It’s hard to imagine that there are still people unaccounted for, whose families have no certainty as to where they were sent and when and how they died. The Nazis stopped keeping records of people who were sent immediately to their death, and so it’s assumed that those people of whom there are no records were murdered immediately upon arrival. As I was walking around Auschwitz and Birkenau, I was thinking at first that maybe it’s important that people do visit these sites so that the atrocities are remembered and hopefully man will be deterred from ever again attempting such a thing. And then I remembered something that I learned studying history – that no one ever learns from history. Tears stream down my cheeks and my heart is filled with grief , anger and despair — unimaginable atrocities . !!!!! Brilliant post about the place you visited. I would love to go and visit it as I have a read about the horrors of World War II. That place is not just a reminder that war is terrible but also to tell us young generation that many innocent lives were lost there. Thanks very much! It’s certainly not the nicest place I’ve visited, but I think it can definitely teach the the younger generation about the dangers of discrimination and hatred, and the futility of such ridiculous beliefs. I think that on an individual level, people can learn a lot from understanding such a place. I hope you get there one day although I doubt it will be a highlight of Poland – there’s nothing fun about it.